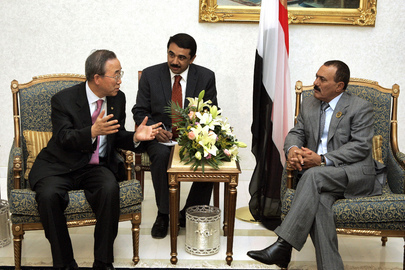 UNITED NATIONS, October 11 -- As the UN Security Council met Tuesday about Yemen, some Council members grumbled about the process by which the United Kingdom and others were preparing a draft resolution on the subject. "I haven't seen a draft," India's Permanent Representative Hardeep Singh Puri told the Press, but now I'm being asked about it. "It's a sad reflection on how some [Council] members function - on the record," he said. Russia's Permanent Representative Vitaly Churkin told the Press that he had suggested a Presidential Statement, as a follow up by the prior Press Statement, and that he had support among some Council members for this. Later on Tuesday, a Russian diplomat told Inner City Press it will of course depend on what's in the UK-drafted resolution. Even another European Council member was unclear who was co-sponsoring the draft resolution on Yemen. The "four horsemen of the EU" approach attempted on Syria does not seem to hold here, one wag noted. The UK draft is expected to be circulated later in the week. UN envoy Jamal Benomar emerged and took questions at the stakeout, on UN Television. Inner City Press asked him about accountability for Saleh, since an earlier Gulf Cooperation Council proposal involved immunity from prosecution. Benomar to his credit referred to actions for accountability at the Human Right Council in Geneva. But when Inner City Press asked about the impact of the Americans killing Anwar al-Awlaki in Yemen -- a topic on which Secretary General Ban Ki-moon's spokesman Martin Nesirky said Ban has no comment at all -- Benomar answered generally about the Yemeni political process. Afterward India's Hardeep Singh Puri said that among Yemen's problems is the number of provinces now in the control of affiliates of Al Qaeda, and the potential to "link up" with the Horn of Africa. We'll have more on this.